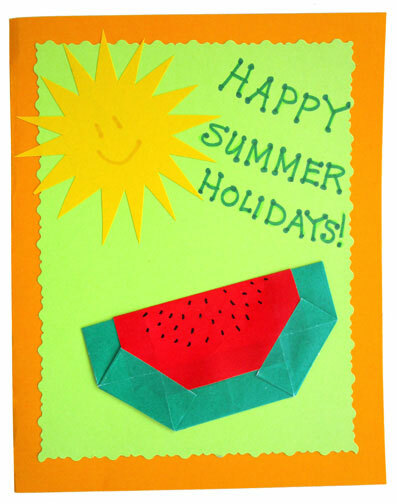 The first recorded watermelon harvest occurred nearly 5.000 years ago in Egypt! It is found in Egyptian hieroglyphics on walls of ancient buildings. The watermelon is thought to have originated in the Kalahari Desert in Southern Africa and it still grows wild in that area of the world. They are tropical or subtropical plants and are grown in many areas of the world today. In 2014, global production of watermelons was 111 million metric tons! Interestingly, there is a traditional Japanese game called "suikawari" that involves splitting a watermelon with a stick while blindfolded. 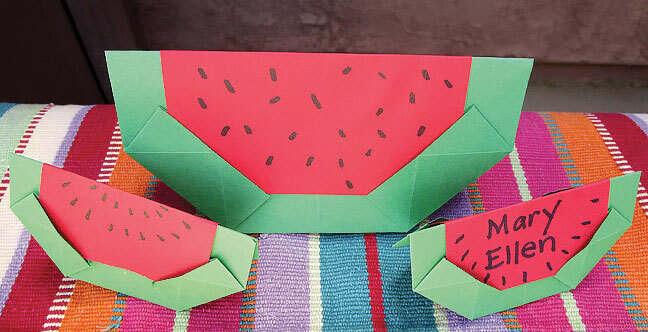 The rules are similar to the Piñata game, except that the watermelon is laid on the ground while the blindfolded participants attempt to smash it open with a wooden stick. The first to crack it open wins, and everyone gets to share in eating the melon! 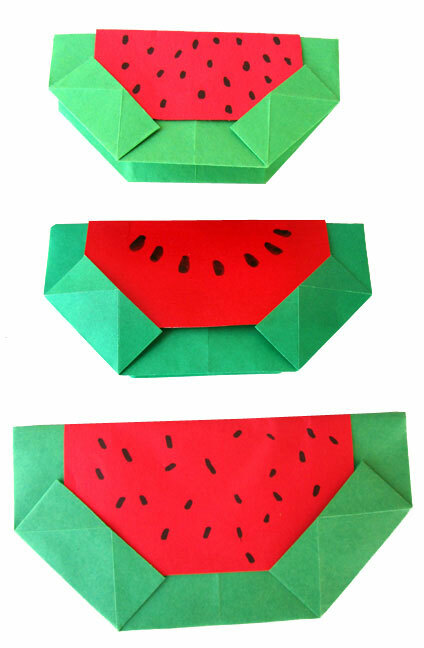 This origami watermelon is from one of my favorite designers, Shoko Ayogi from Japan. She presents a very playful style in the origami models she creates. 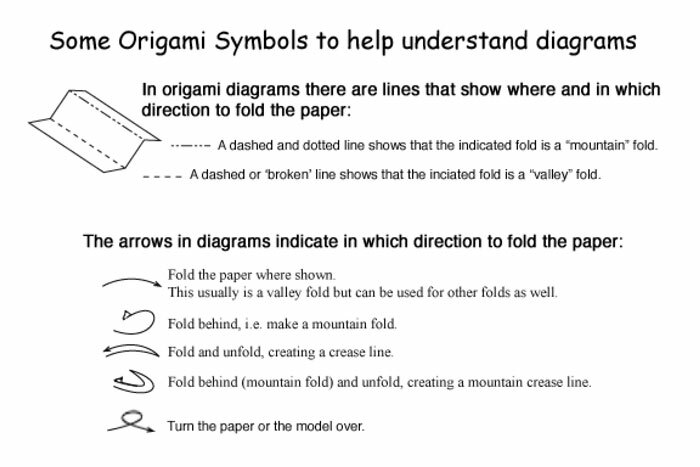 I love to use this particular model to decorate greeting cards for the summer months. 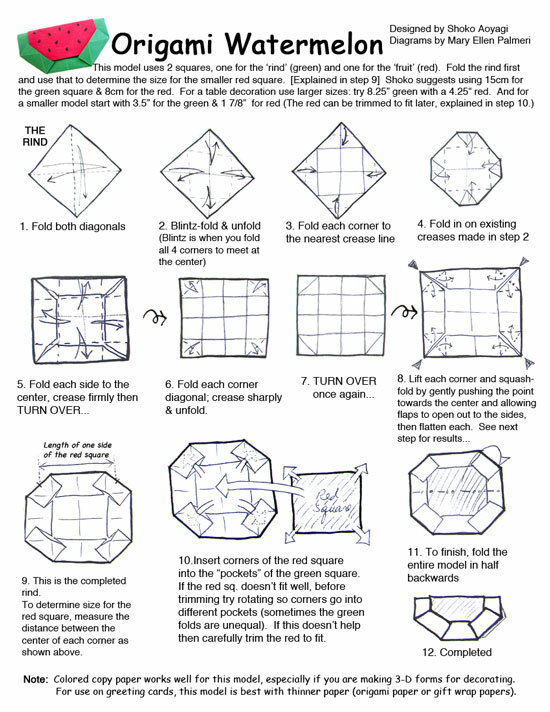 Large models are fun to use to decorate a festive party table as they will stand by themselves, and smaller models can be used as place-cards.